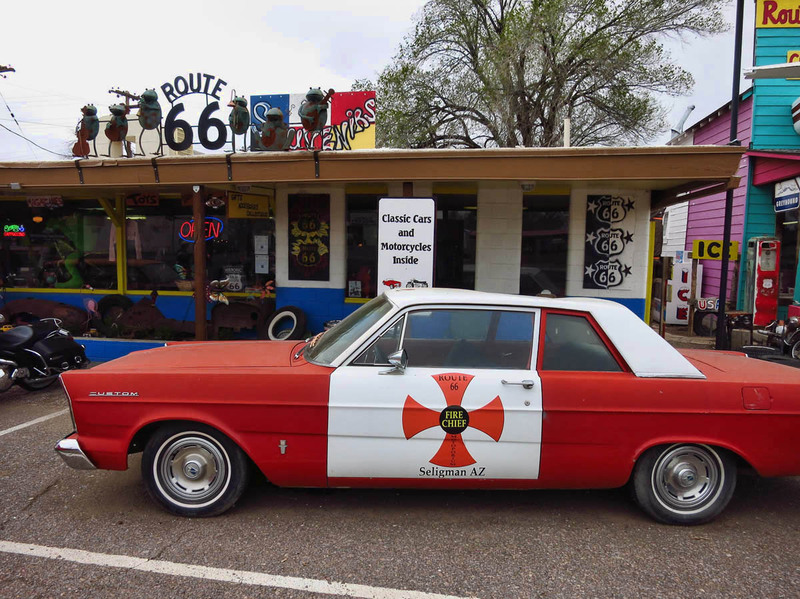 I have often thought I would like to drive the Historic Route 66 in its entirety one day. Known as “Main Street America,” this iconic road was once the main thoroughfare for travelers looking to “motor west.” One of my earliest childhood memories is driving this route through New Mexico and Arizona on our way to Hollywood. My favorite stops were always the teepees and Indian Curio Shops. I can still remember my fascination with the leather and feathers used in the warrior costumes. Back then, the “Indian dances” took place for free along the roadside to beckon customers to stop and shop for plastic dolls, fake turquoise, and fancy Indian headdress replicas that probably weren’t even “Made in China” back in those days. I never could figure out if this place was so desolate because of the time of year, or due to disrepair. It was a confusing contradiction. 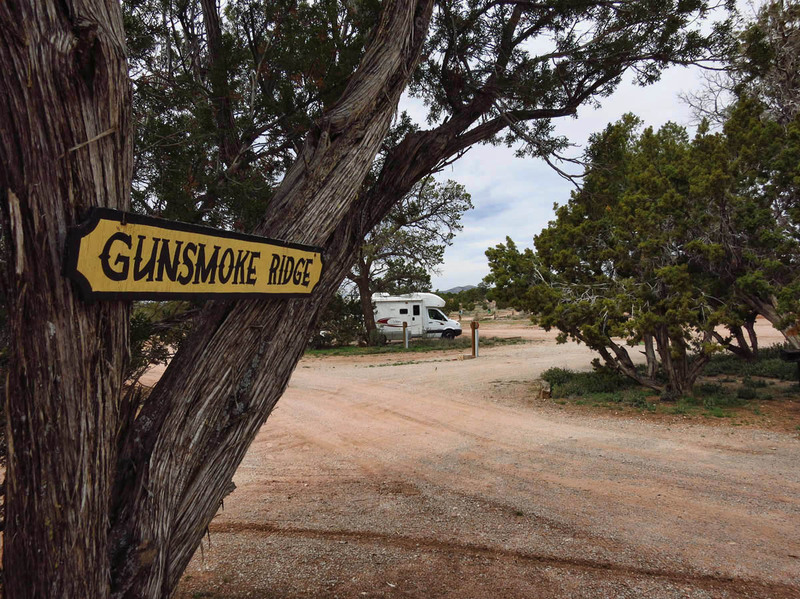 For instance, the RV sites were all well maintained, with evidence of events like group barbeque areas and an amphitheater advertizing “Ghost Walks.” I saw a sign for a Good Sam Rally in May. Yet the bathrooms were all boarded up with instructions to “Use the Port-a-John.” I reserved for the dry camping area, but when I arrived, I was told to “Park anywhere you like.” I was the only rig in the lot. 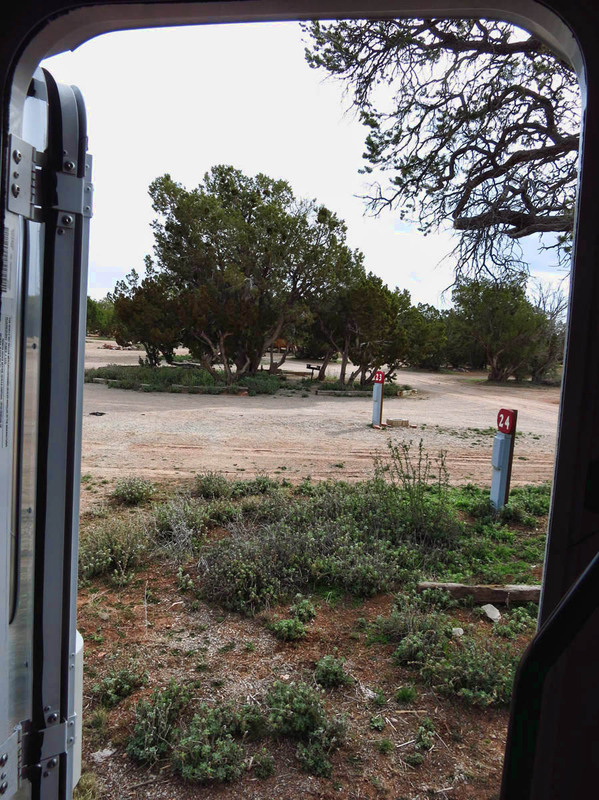 Looking out the door of the Winnie at the adjacent campsites. Might not be so pleasant in high season. 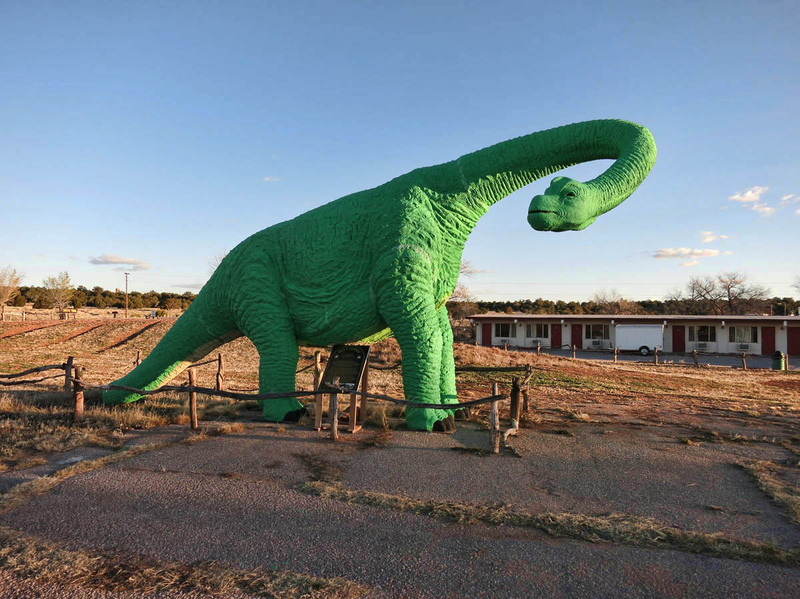 Why would you go to all the effort to make a dinosaur this life-like, then paint him chartreuse? 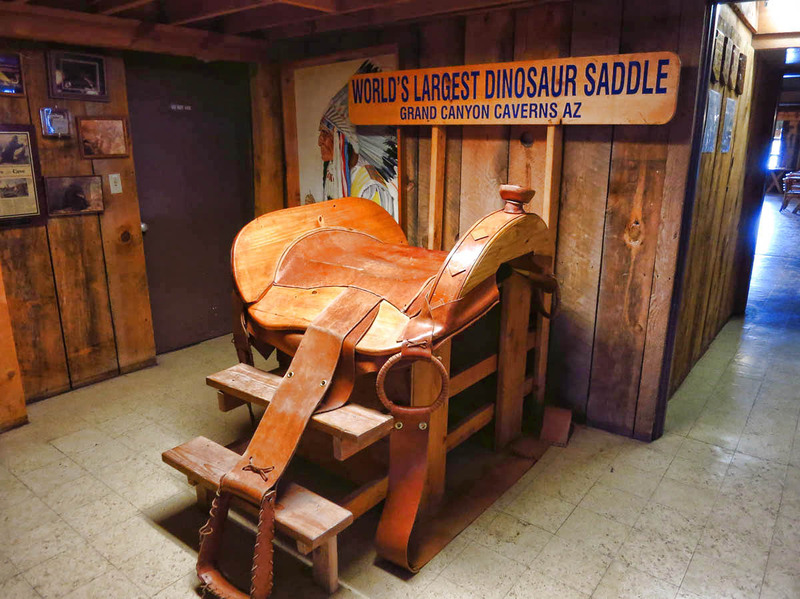 Grand Canyon Cavern Inn is catering to many audiences, in spite the fact that few seemed to show up. 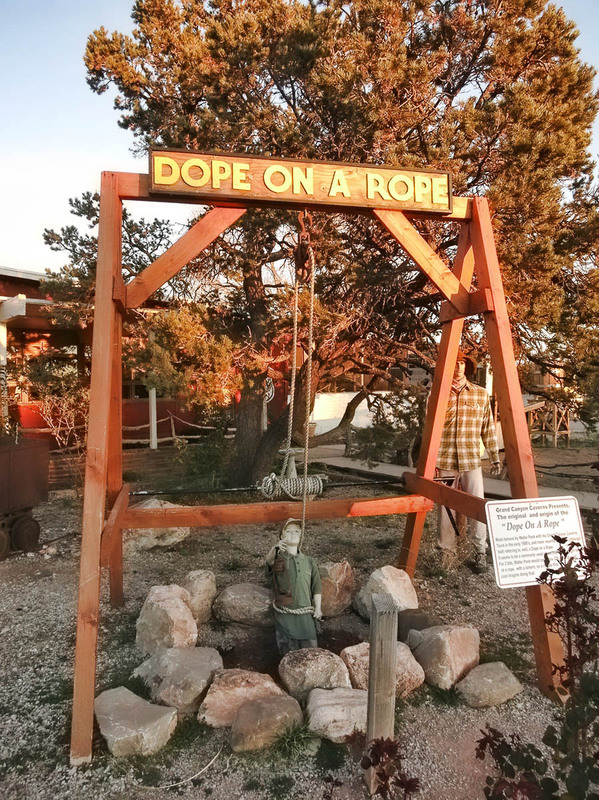 Not only are they billed as the closest stop to Havasupai, but they also have a lot of Route 66 shtick out front to attract the road trippers. But probably their biggest draw is the caverns themselves. 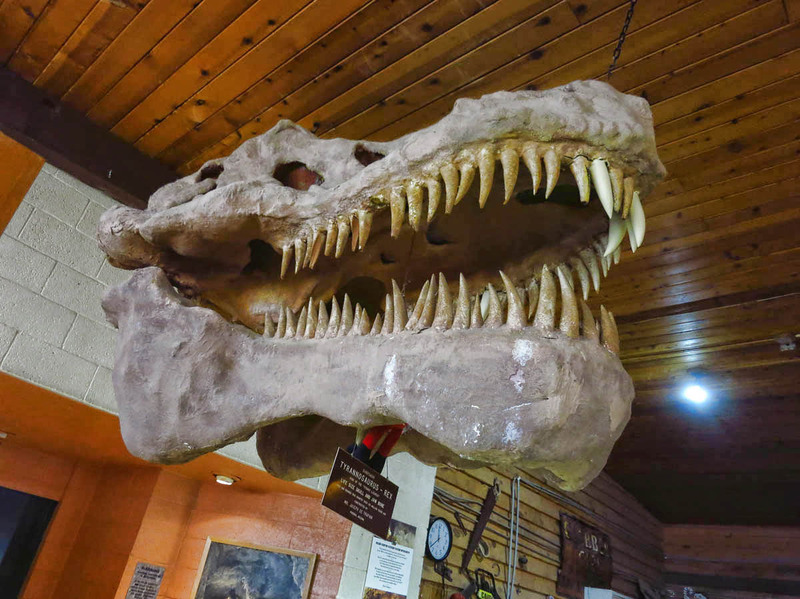 Billed as “The largest dry cavern in the United States,” the gift shop has almost enough paraphernalia fill a cavern in of itself. Being “dry” means the caverns have no stalactites or stalagmites. 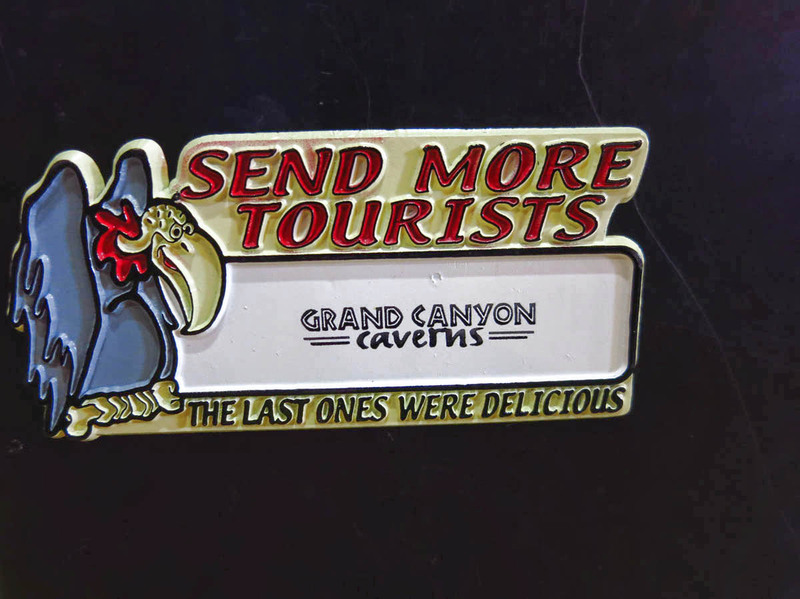 For this reason, I just couldn’t muster up the interest to pay $19 for a 45 minute tour, especially just having visited both Carlsbad Caverns and Mammoth Cave last year. As one of the patrons was coming off the elevator, I lie in wait to ask the burning question “Was it worth it?” His answer, “Well….you’ve come all this way…” was enough to tell me what I wanted to know as I thanked him and walked “all this way” back to the Winnie. 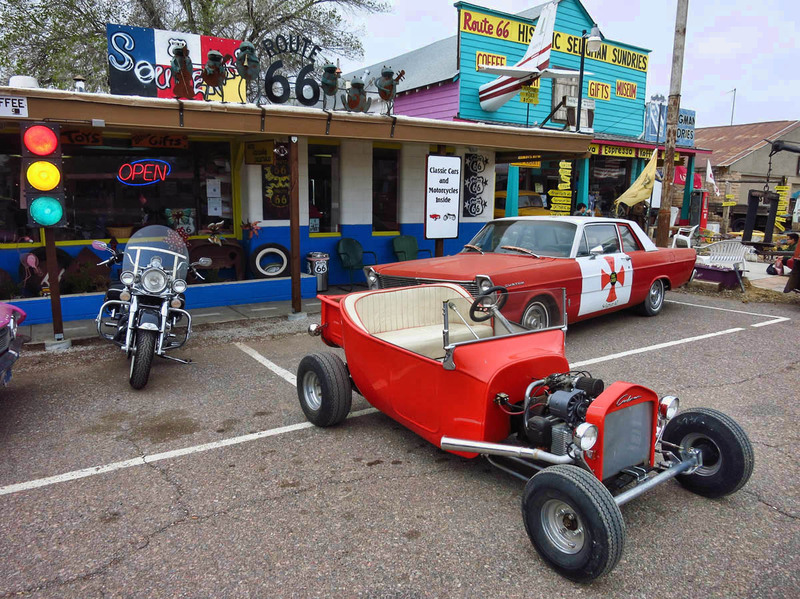 This entry was posted in Arizona and tagged Route 66 by Suzanne. Bookmark the permalink. Sounds very strange, indeed. Love the “delicious” sign! 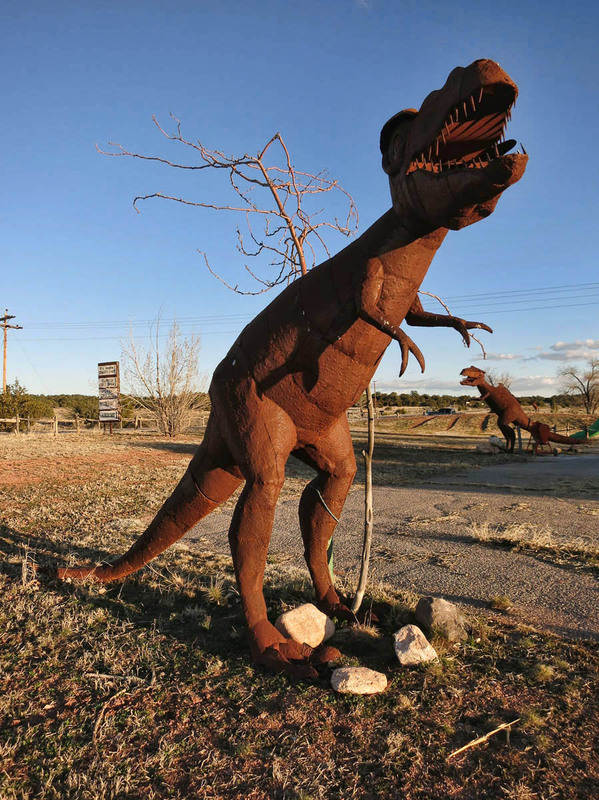 Really makes you wonder about the “resurgence” of Rt 66. But at least it was quiet. I too remember cross country travel as a kid in the back of the station wagon eyeballing all the tourist traps that we never stopped at. Strange place. Yes R 66 does make you want to travel it even its just to live a dream, as in my case. But I have often found that places like this are often best lived and enjoyed in either your memory or imagination. Present day reality can sometimes be too harsh and disappointing. The Stones version is my favourite! Sounds like a strange little place, but relaxing.